A temporary shuttle-bus service from the National Mall makes August an ideal time to visit two important D.C. cultural sites east of the Anacostia River. 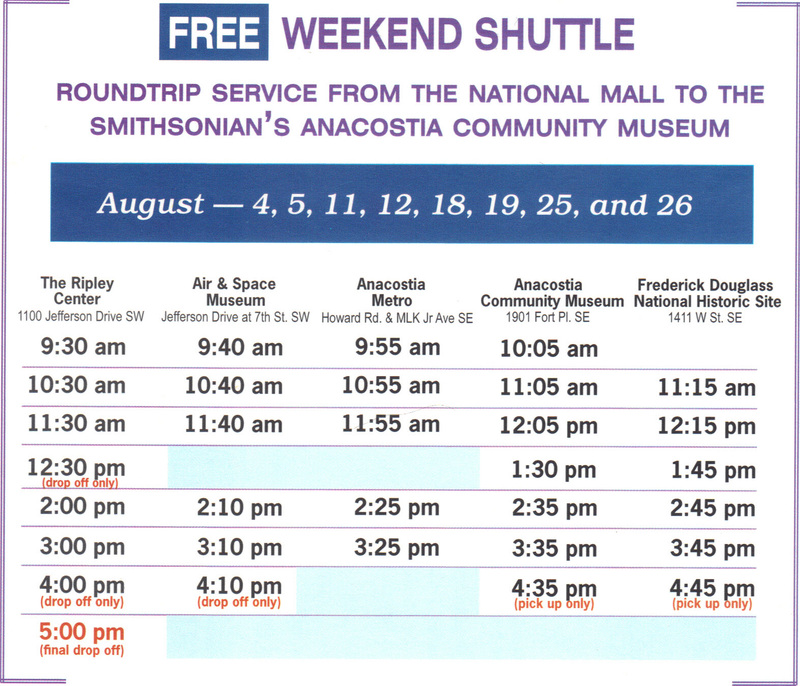 Starting Saturday, Aug. 4, and continuing each weekend in August, the free shuttle bus will link the Mall to the Smithsonian’s Anacostia Community Museum and to the Frederick Douglass National Historic Site. Shuttle stops on the Mall will be the Ripley Center, 1100 Jefferson Drive S.W., and the Air & Space Museum. The shuttle also will stop at the Anacostia Metro Station. For a complete shuttle schedule, click here. 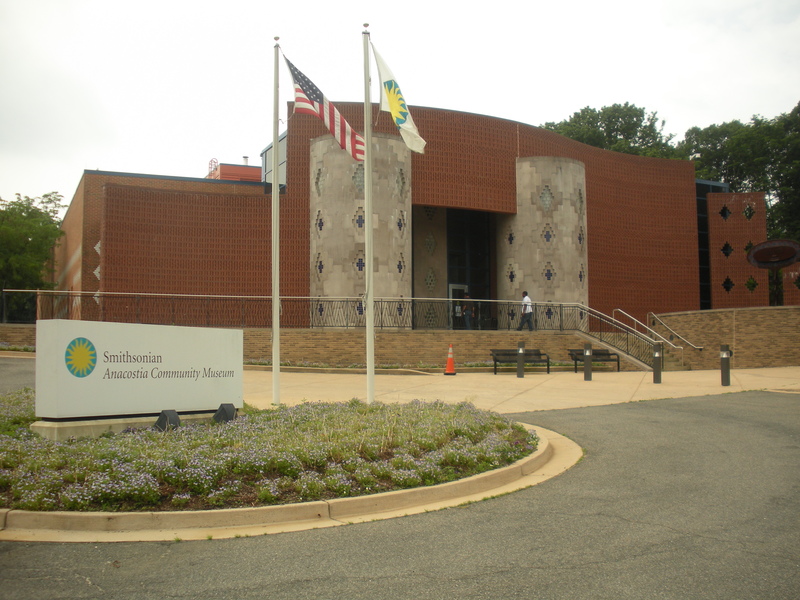 The Anacostia Community Museum, founded in 1967, traditionally has focused on the African American experience from a community perspective. Now emphasizing more broadly the concept of community, the museum maintains strong ties to Anacostia and the Washington region. Public spaces of the museum reopened this week after a closure of almost three months to accommodate a major lighting upgrade. The museum exhibition “Separate and Unequaled: Black Baseball in the District of Columbia” has returned to public view. ● Aug. 4, 10 a.m.: Collage-design workshop with Jay Coleman. ● Aug. 5, 2 p.m.: East of the River Boys and Girls Steelband. ● Aug. 11, 10:30 a.m.: Performance artist Kwelismith on Harriett Tubman and the Underground Railroad. ● Aug. 19, 2 p.m.: Clothing consultant and apron designer Velma Crawford on her grandmother’s inspirational influence. ● Aug. 25, 2 p.m.: Eileen Torres and others discuss female musicians in the male-dominated world of Salsa music. Jim Byers of WPFW-FM moderates. The band All-Star Female Descarga performs. Behind-the-scenes tours of the museum, which highlight rarely seen artifacts from the museum collection and preservation efforts, are offered at 10 a.m. every Friday in August. Call 202-633-4844 for reservations, and meet at the museum’s staff entrance no later than 9:55 a.m.
On a recent Friday morning, your litter blogger was fortunate to join one of the behind-the-scenes tours. Our guide was Jennifer Morris, an archivist at the museum, though various staff members rotate the duty of leading tours. Our tour group passed by a piano once owned by Madame Lillian Evanti, an internationally renowned opera singer who was born in Washington. The museum’s holdings include the Evanti family-history collection. In the archives storage room, we saw an original copy of Frederick Douglass’ abolitionist newspaper, the Liberator. The chilly photo-storage room, among its many images, holds a photo of Douglass returning by ship from his post as U.S. minister to Haiti. The museum’s archives also include rare audio recordings and other items related to the work of Lorenzo Dow Turner, a pioneering linguist who graduated from Howard University and earned graduate degrees from Harvard University and the University of Chicago. His research in the 1930s among the Gullah people of the South Carolina and Georgia Sea Islands established links between their creole language and the West African languages of their ancestors. On September 17, the museum will launch a new exhibition, “Reclaiming the Edge: Urban Waterways and Civic Engagement,” that examines efforts to restore the Anacostia River and other urban waterways beset with pollution. The exhibit will run through August 11, 2013. The Frederick Douglass National Historic Site preserves Cedar Hill, the home where the great abolitionist, orator, and newspaper publisher lived from 1878 until his death in 1895. During that time, Douglass was U.S. marshal for the District of Columbia, the District’s recorder of deeds, and U.S. minister to Haiti and chargé d’affaires to the Dominican Republic. 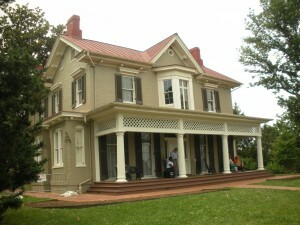 Cedar Hill, the home where Frederick Douglass lived from 1878 until his death in 1895. Cedar Hill afforded Douglass a commanding view. As a park ranger noted during a recent tour of the house, to the northeast Douglass could see the rolling hills of Maryland, the border state where he was born into slavery; to the northwest, barely more than a mile away, was the imposing dome of the U.S. Capitol, symbol of a federal government that held the promise of full civil rights for freedmen. The historic site will feature a family festival from 1 p.m. to 4 p.m. on Sunday, Aug. 5, with music; crafts; house tours; bike rides; free ice cream and popcorn; and Massachusetts 54th reenactors. Tours of Cedar Hill are scheduled six times daily through October 31. Admission is free. Wayne Savage is the owner of Mid-Atlantic Litter Cleanup Service, a Washington-based public space litter removal service. This entry was posted in Anacostia Community Museum, Cedar Hill, Frederick Douglass National Historic Site by Wayne Savage. Bookmark the permalink.